The controversy of having four players denied the opportunity to play continues as Bermuda took to the court for game four of the FIBA AmeriCup 2021 Caribbean Pre- Qualifiers in Paramaribo, Suriname. Bermuda was once again forced to play with just six players dressed. Bermuda took on Haiti going down 96 – 60. Bermuda was down 20 – 13 at the end of the first period, Bermuda was outscored 23 – 10 in the second period to go to the break, down 43 – 23. 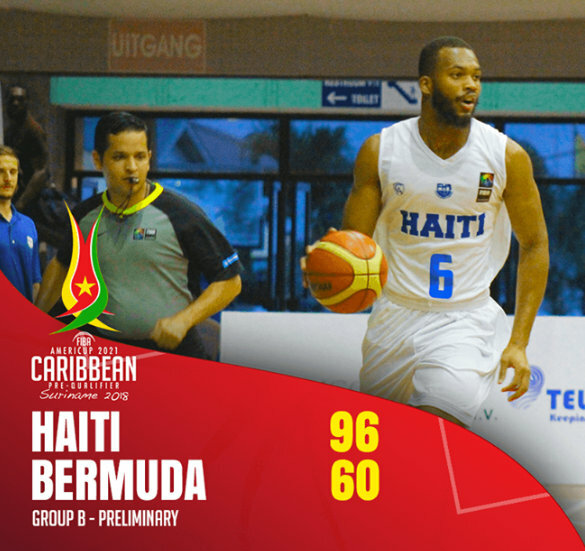 Bermuda would score 19 points in the third period, but Haiti would score 25 to take a 68 – 42 lead into the final period, Haiti would outscore Bermuda 28 – 18 in the final period to record and the win. Chris Crumpler led Bermuda in scoring with 27 points, while Te’Jour Riley chipped in with 16 points and Jason Lowe added 15 points. Lowe grabbed 10 rebounds, with Riley getting 9 and Crumpler grabbed 7 rebounds.